The holiday season has officially kicked off at the Disney Land Resort with seasonal favourites including Disney Festival of Holidays and ‘Believe … in Holiday Magic’ Fireworks Spectacular! The jolly season has arrived at the happiest place on Earth from today up until the 6th of January. • Sleeping Beauty’s Winter Castle enchants from day to night with its shimmering icicles and twinkling lights. After dark, “Believe … in Holiday Magic” fireworks spectacular and its magical snowfall finale create lasting holiday memories. 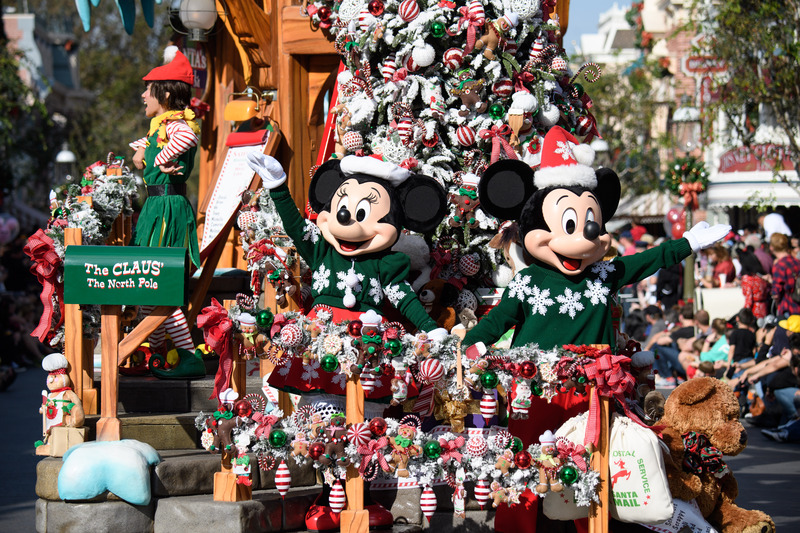 • Guests will be amazed by the 60-foot tall Christmas tree in Town Square, Main Street, U.S.A., a picturesque sight where friends and family gather to take holiday photos each year. This year, the tree includes new lighting and décor, with 3,500 multi-color lights, 1,500 Victorian-inspired ornaments and 100 faux candles that range from 12 to 22 inches tall. • Disneyland guests definitely will want to experience the popular seasonal transformations of these park attractions: “it’s a small world” becomes “it’s a small world” Holiday with dolls and toys representing children around the world enjoying the distinctive holiday traditions of their countries. Haunted Mansion becomes Haunted Mansion Holiday, with Jack Skellington and his friends from “Tim Burton’s The Nightmare Before Christmas” causing a collision between Christmas and Halloween. • Disney Festival of Holidays brings the spirit of the season to life through special entertainment, along with delicious food at the Festive Foods Marketplace, which features a mix of holiday dishes and beverages that bridge many diverse cultures and family traditions. • The residents of Cars Land decorate for the holidays, too. Each address along Route 66 – Flo’s V8 Café, Fillmore’s Taste-In, Cozy Cone Motel, Luigi’s Casa della Tires and more – gets a holiday makeover that reflects the personality of its “Cars” character resident. Plus, two attractions put the holiday cheer into overdrive, transforming into Luigi’s Joy to the Whirl and Mater’s Jingle Jamboree. • Guests can enjoy special holiday-themed activities with Santa Claus and his sleigh full of mischievous elves at Santa’s Holiday Visit at the Redwood Creek Challenge Trail through until 24th December. From 25th December through to 6th January guests may encounter Santa Goofy in this festive location. • A dazzling, 50-foot Christmas tree adorns Carthay Circle along Buena Vista Street. The tree and surrounding buildings, inspired by Los Angeles as it appeared when Walt Disney arrived in the 1920s, are decorated with vintage-style ornaments. The Downtown Disney District shopping, dining and entertainment promenade and the Hotels of the Disneyland Resort also join the holiday festivities with twinkling lights and ornaments, holiday displays, special entertainment and holiday-inspired eats and treats. Just when we thought Wednesday humpday couldn’t get better, Goldman Group’s Anthony Goldman started talking about tiramisu and polar bears. California has fallen victim to savage bushfires which have already killed 24 people and have now surrounded a world-famous amusement park. We’re green with envy at this 10-year anniversary celebration, although it could just be the two-day old sushi we had for dinner last night.